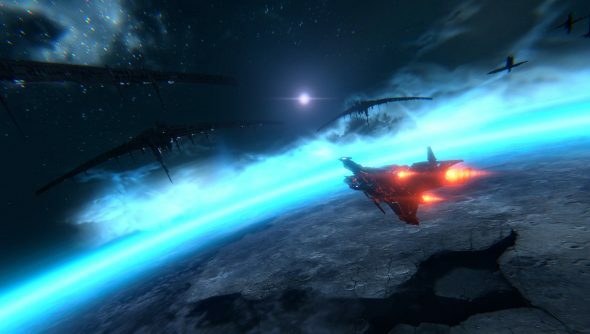 Star Conflict, the free-to-play space combat MMO, just got a big update. If you’ve already got your hands on an Oculus Rift, you’ll be able to flit around the stars, getting in high speed chases, all without the distractions of the real world. Gaijin Entertainment and Star Gem Inc. have also added Linux support on top of the Oculus Rift update, which means it now supports Windows, Mac and Linux. As it’s the two-year anniversary of Star Conflict, the premium DLC packs – purchasable on Steam – are now on sale, for 50 percent off. The packs contain special themed ships, like pirate-themed frigates and cosmetic stuff like stickers to slap on your shiny new vessel. Every player gets premium account access until Monday, to boot. It’s been a while since I took the game for a spin, but I had a ruddy good time hunting down stealth ships, sniping frigates and zipping between asteroids. There was also a solid sense of progression. Rather than playing for days and days to unlock new content, within a few hours I’d unlocked new ships and new weapons and abilities by completing factions objectives and carving foes up with lasers.